Weather over the past few days has allowed our cotton crop to dry down substantially. Still, it is unlikely the areas which noted sprouting will be dry enough to pick until mid-week (Oct. 3). In this post, I cover the factors to consider and potential impacts should you rush into harvest before the crop has sufficiently dried. 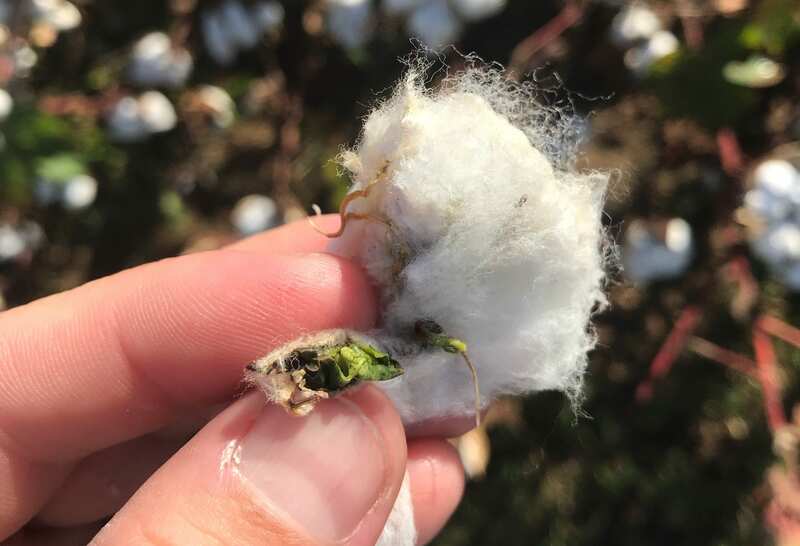 Since my last post, reports of sprouting have spread across most major cotton producing counties in TN. In most of the fields I’ve walked, the majority of the seeds have not germinated. This is good news; if we allow the crop to sufficiently dry, we should be able to reduce yield and quality penalties. Still, we must allow all seedcotton to thoroughly dry or the moisture contained within the percentage of germinated seeds will impact the fiber quality of all lint- including the lint which is attached to seeds which have not germinated. Waiting for seedcotton which contains sprouts to dry is different than waiting on damp seedcotton to dry. According to the National Cotton Council, a crop which contains sprouts should be allowed to dry 7 to 10 days. The additional time required to dry seedcotton which has sprouted as compared to normal seedcotton is due to the protected nature of the sprouted seedlings, which are buried deep within each locule. The first step in the germination of a cottonseed is the uptake of water. While our weather has dried the radicle and parts of the shoot out, the cotyledons still contain a considerable amount of water- and these tissues are buried within a seedcoat which is surrounded by a substantial amount of lint (see above). The cotyledons I inspected today (Sunday, Sept 30) still contained a considerable amount of moisture. 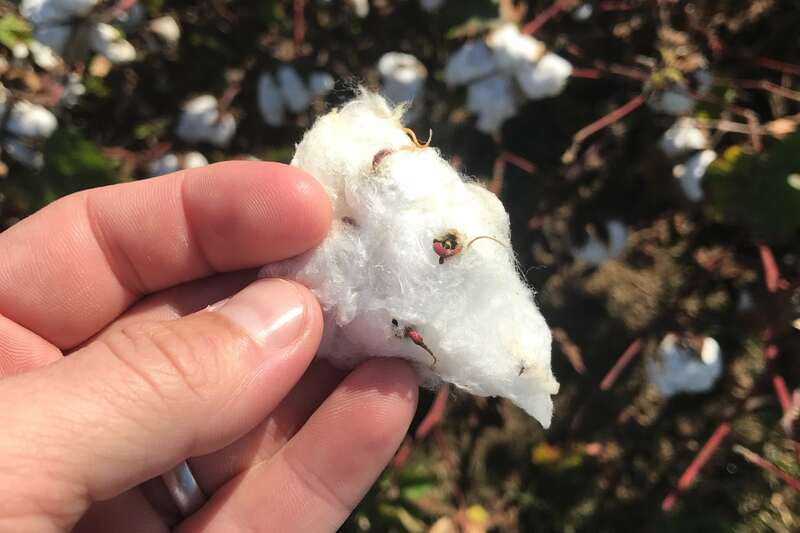 Since they are buried deep within the boll, applications of herbicidal defoliants/desiccants will likely only contact a small portion of the seedling. Poor coverage is one reason these applications show mixed results for speeding the drying process. Should you decide to pick, call your ginner and monitor module temperatures. Placing moist seedcotton within a module will result in the module increasing in temperature. As module temperatures climb, quality degrades rapidly. The only way to halt the process is to gin immediately. Fortunately, another day of rain should not have a large impact on this crop- and the chances for rain over the next few days have dropped. We will need another prolonged period of rain before any new seedlings germinate. Additionally, the radicles of seedlings which have already germinated are currently shriveled- these seedlings will not spring-back to life with another rain. Instead of picking, I’m using this window to address juvenile growth. The current forecast contains temperatures much higher than anticipated; night temps are above 65 for the next week. Still, I’m running stout rates of Aim/Display/ET/Sharpen or Ginstar (Adios, Cutout). Stripping all green material will reduce the moisture content and protect the remaining quality of our crop. Take Home: Wait. If you decide to pick, call your gin first and monitor module temperatures.